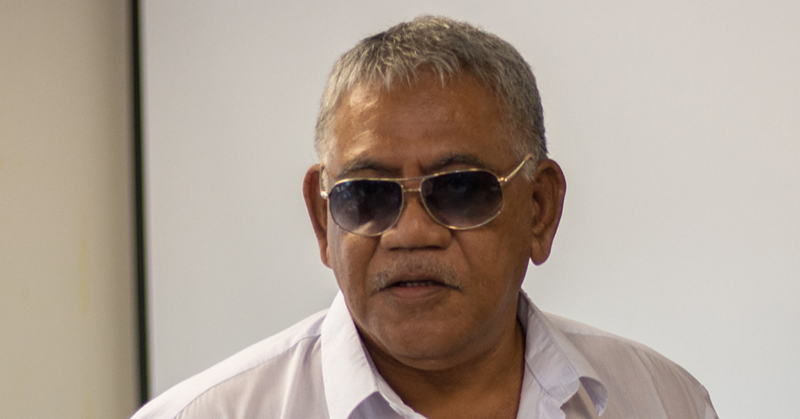 These were the words uttered by his son and Member of Parliament, Aumua Leavasa Siliili Isaia Lameko, while describing his father, Member of the Council of Deputies, Tuiloma Pule Alaimoana Unasa Lameko Gae’e, who passed away last week. Tuiloma died peacefully at the Tupua Tamasese Meaole Hospital. 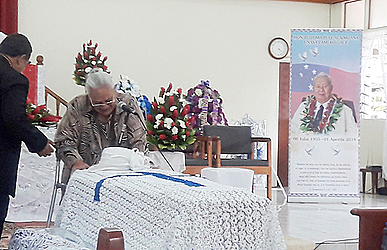 Aumua was among a host of people who delivered eulogies during the family service held yesterday at the Alafua C.C.C.S. and conducted by Reverend Elder Lale Ieremia. Aumua, who replaced his father in Parliament when he took up his post in the Council of Deputies, spoke of the fond memories shared with his father. “This is my first time in office, and it has been difficult but my father always emphasized the importance of service,” Aumua said. “I have to serve my Constituency, my village, my church and my family." “As many Chiefly titles I have, when I am in my father’s house, I am just that, his son. I leave my respective titles at the door when I enter his home and that is how we were brought up." “When I am at his house, dad is the boss, meaning I will cook his food, clean when necessary and sometimes feed the pigs, but one thing he never lets us forget is that we are here on this earth to serve." 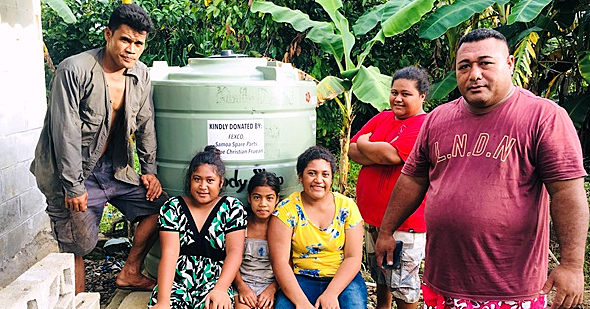 “Our calling is to serve in church, the Government, in the villages and in our family that service continues,” said Aumua. He recalled at the age of 16, the day after the bestowment of his Chiefly title. “I got to the umu and I saw my name of the roster to feed the pigs, I told myself I am now a Chief and I will not feed the pigs. I told the boys feed the pigs when you’re done with the umu. The Chief is going to church." “Up until this day, I regret ignoring the roster. I was reminded by my father the roster must be adhered to no matter how many Chiefly titles you have." 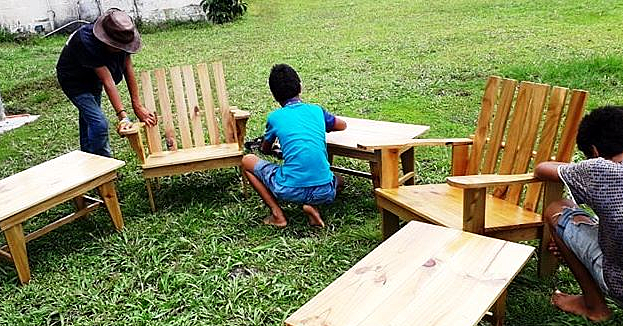 “And inside my father’s humble home is where humility is taught at all times,” said Aumua. Tuiloma’s sister, O’omi Saifoloi, also shared with the audience when they lived in Tufuiopa, Tuiloma grew up in a Fale Samoa. “There are six of us, three boys and three girls and I’m the second eldest from Tuiloma." Mrs. Saifoloi shared with the audience her brothers’ efforts entering the political arena. The first time Tuiloma ran for office, he was told to restructure his tactics in winning the hearts of his people. “We advised him to serve his constituency, be active in the affairs of the village and serve in the church and family." “And the end result is showcased in his many years in office until he was hailed a seat on the Deputy Council Member." “God’s timing is important,” said Mrs. Saifoloi. Starting today, the national flags will fly half mast in honour of Tuiloma as the nation prepares for his state funeral on Friday. He will be laid to rest at his residence at Alafua.